In 2005, The American Horse Council conducted a survey that, at last, told the truth of it. The Department of Agriculture census verified that truth: Marion County in central Florida has more horses and ponies than any other single county in the United States. This patch of "sand, alligators and palm trees," as long-ago Kentuckians used to scoff, has more than proven itself as an important breeding and training ground for every imaginable breed of equine, from miniature horses that could have been used in The Hobbit movie series to impossibly long-maned and long-tailed Gypsy Vanner horses straight out of a little girl’s dream come true. The county is also host to one of the largest horse shows in the country. HITS, or Horses in the Sun, generates between $6 and $7 million in the two months it is held in the county. The new Florida Horse Park hosts many eventing, dressage and driving competitions, and the county is part of the 110-mile Greenways corridor sweeping across the state and allowing riders long, safe trail rides. More than nine hundred farms provide homes to these horses and ponies, including some of the finest racehorses in the world. It is the Thoroughbred that is the topic of this tale, the instigator of all this popularity among the horsey set. Central Florida is second in the United States for the highest concentration of Thoroughbreds, on a par with only three other places in the world: Lexington, Kentucky; Newmarket, England; and Chantilly, France. The State of Florida hosts about 600 Thoroughbred farms and training centers, of which 75 percent, some 430, are located in Marion County. More than seventy thousand acres of this lovely, rolling green countryside are devoted to the Thoroughbred industry alone. Known as the "Horse Capital of the World,"™ Ocala/Marion County in 2013 was home to about 35,300 Thoroughbreds. This high concentration is strongly supported by a network of services such as veterinarians, feed and tack retailers, blacksmiths, equine dentists and horse transportation companies. According to the American Horse Council Economic Impact Study of 2005, the industry creates an economic impact of more than $2.2 billion annually and provides twenty-seven thousand full-time jobs, more than thirteen thousand in the Ocala/Marion County area. This is a higher number than the entire population of the county at the time the industry began in the 1930s. These Thoroughbred farms and training centers have produced forty-seven National Champions, six Kentucky Derby winners, seven Preakness Stakes winners, six Belmont Stakes winners, twenty-four Breeders' Cup Champions and six Horses of the Year. The crowning glory is one Triple Crown winner. Only eleven horses have ever won that Classic series - the Derby, Preakness and Belmont - but none has succeeded since 1978, when one bred and trained in the Sunshine State claimed that coveted crown. The story of the unprecedented growth of a multibillion-dollar industry is as good as any cowboy and Indian movie. Besides home-breds, however, many Thoroughbreds bred in other states are also raised, trained, wintered over and in other ways benefit from what Florida has to offer: year-round warmth and sunshine. For many years, the Thoroughbred industry has been one of the most important industries in Florida, on a par with tourism and citrus. But in its formative years, the struggle was uphill. 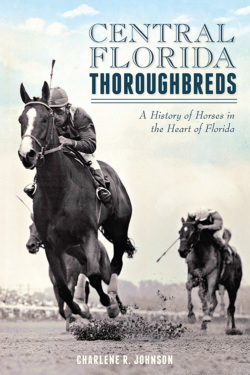 Out-of-state horsemen accustomed to the tame, rolling green of Newmarket or Lexington, with their neat white fences, could not imagine raising blue-blooded racehorses in the wilds of 1930s -1950s Florida, a land more reminiscent of the Wild West. No one involved in the Thoroughbred industry elsewhere took the visionary Floridians seriously. The story of the unprecedented growth of a multibillion-dollar industry is as good as any cowboy and Indian movie. Against all odds and scoffers, riding the economic surf of the 1980s and 2000s, the tale continues to be rife with heroism, passion and faith. It is a tale of dedication, persistence and an absolute belief in a land that much of the North American population considered as strange as a foreign country. It is a story rich in characters both equine and human, and it continues to be the stuff of which dreams and riches are made. When it comes to racehorses, the animal follows the dollar; it is, after all, a business based on gambling. But it is also a sport, if the "Sport of Kings.'' The farms on "Million Dollar Row" or the one patterned after the television series Dallas, as well as the view of copper steeples set against green, richly fertilized, rolling pastures, certainly attest to the fact that some of the wealthiest people in the world own, breed and raise racehorses. But so do some of the poorest. Today's industry sees a much different face from the times when old money traveled from New York via train and plane to Hialeah and Cuba to enjoy the tropics, gambling and fast horses. A vast majority of today's horsemen and horsewomen are just like you and me: ordinary people with a dream and a passion for the most noble animal on earth. "My kingdom for a horse" is easily understood by such people.